I was not happy when I heard KKR is almost out after yesterday’s loss, KKR is right now at 4th place in IPL 2015 points table with 15 points and 0.25 run rate, many of the KKR fans including the team owner SRK already agreed that KKR is almost out of league but there is still a chance of KKR to enter in qualifiers if MI vs SRH match, last match of IPL 2015 is washed is out without being result of winning come and both teams are awarded on points each. 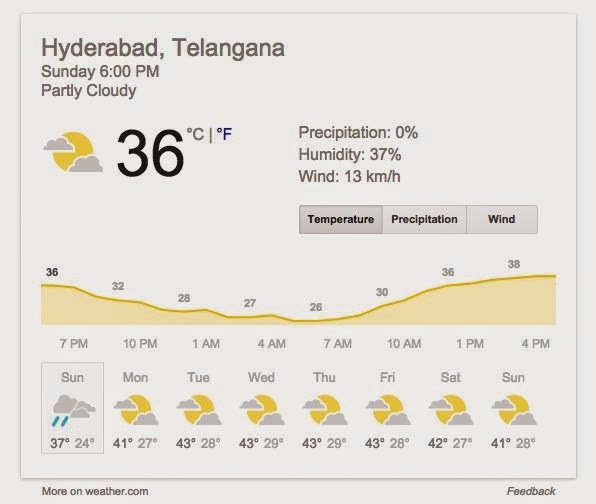 Being a die hard fan of KKR, I was glad to know about this equation and my joy was double when I googled about the weather prediction of Hyderabad today where the MI vs SRH match is going to be played, what Google showed is attached below and its raining prediction yes, you heard right its raining prediction. What I mean to say is that there is chance of rain in Hyderabad and if the match is washed out without result of winning of any team then KKR will be in as they have better run rate with compare to both MI and SRH run rate which is in minus actually right now. KKRians, you can do only one thing, pray for the heavy rain in Hyderabad so that the match is cancelled without the result and you will see the KKR to stay at top 4 without doing any thing and you will not be causing Piyush Chavla responsible for KKR’s anticipated exit of IPL due to his inning of 1 run in 7 balls in last to last match. But, when I tried to get the hourly weather updates, Accuweather showed that chances of rain is very low, yet your prayer may work and we can see a long thunderstorm in Hyderabad and the match will be washed eventually. KKRians, lets hope for the best and pray for a heavy thunderstorm in Hyderabad till 1 AM.